BASIL OIL is extracted through the process of steam distillation. The Chemical Composition of BASIL OIL includes linalool, limonene, methlyhavicol and methlycinnamate. 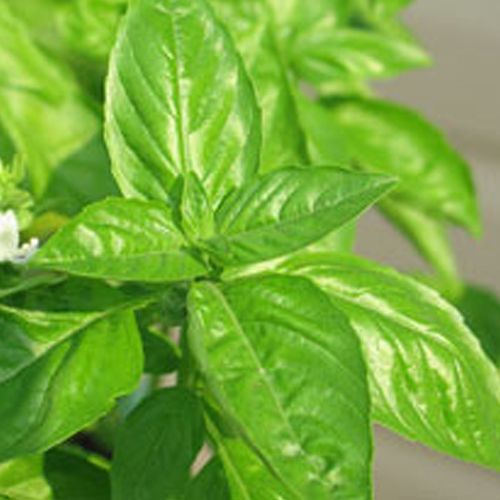 Basil Oil offers pleasant aroma, which is fresh, warm, spicy, herbaceous. It is basically a sacred plant, This oil is used as a strewing herb that helps in reducing odors and has properties like Antibacterial, stomachic, antiseptic, febrifuge, antispasmodic, carminative, cephalic, antidepressant, digestive, emmenagogue, expectorant, nervine, stimulant, tonic. This oil plays an active role in treating colds, anxiety, infection, flatulence, fatigue, insect bites and repellant, sinus infection, bronchitis, coughs, depression, abrasions, whooping cough. However, it is made using herbal ingredients that helps in stimulating hair growth. It find application in industries like perfume, cosmetic, soap production, food, medical etc. BASIL OIL has a watery viscosity and is pale greenish-yellow in color. The therapeutic properties of basil oil are analgesic, anti-venomous, carminative, cephalic, antidepressant, antispasmodic, diaphoretic, digestive, emmenagogue, expectorant, febrifuge, insecticide, nervine, stomachic, sudorific, tonic and stimulant. BASIL OIL is used for indigestion, stress, sinusitis, insect bites, headache, muscle relaxation, anxiety, bacterial infections, depression, panic attacks, hair loss, insomnia, menstrual cramps, intestinal problems, nausea, ear infections, massage, bathing, inhalation, diffusion and as a study aid. This oil it should be avoid in epilepsy, liver problems, and while pregnancy. It can cause skin irritation, if it does not suits the user.